This past weekend, I was given the unbelievable honor of being the wedding officiant for my two good friends Arnaud and Sarah. The sun was high, the skies were blue, and the couple was radiant. I may have been even more nervous than the couple, but somehow we all got through it. 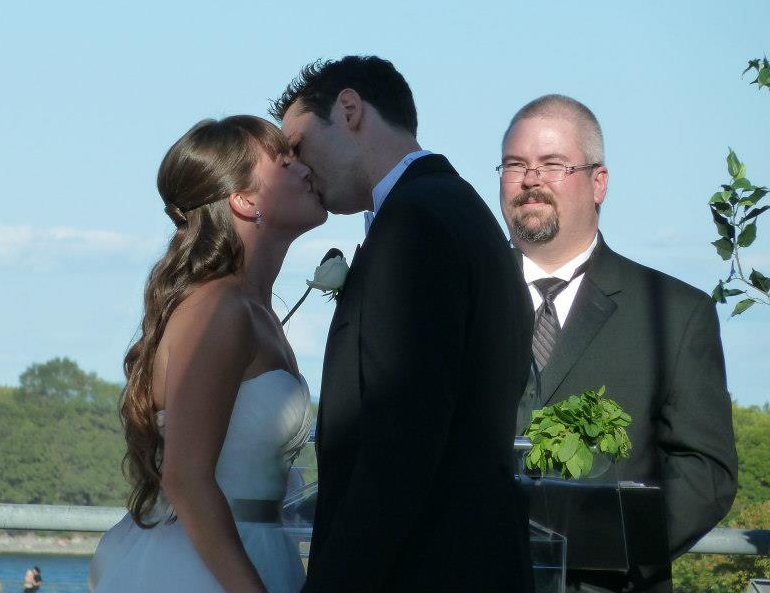 By popular request, here is the wedding speech I gave that day. I was asked to make the speech bilingual, so the parts in italics are the source texts for what I said in French (translated by Hesser G. and reviewed by Julie D. and Sarah C.). If you’re curious, the groom’s brother put together this video montage about the couple. Also, a shout-out to Sabrina at Platinum Wedding Services who did an amazing job putting this all together. Ladies and gentlemen, boys and girls, friends and family, and friends we will meet tonight, thank you for joining us to celebrate Arnaud’s and Sarah’s wedding day. When they asked me to be the officiant early this year, I promised them I would make my speech Short, Sweet, Memorable, and Bilingual. I think the Memorable part makes them both a little nervous, but it’s too late now. Before we begin, I would like to invite the crowd to share their blessings with the couple by reading the following words (I held up cue cards): MAWAGE, A DWEAM WIFIN A DWEAM, IS WOT BWINGS US TOGEDDA TODAY. WUV, TWU WUV, WILL FOWOW YOU FOWEVA. SO TWEASURE YOUR WUV AS WE TWEAURE YOU FOWEVA. Nous nous retrouvons aujourd’hui non seulement pour témoigner de l’unisson de ces deux vies, mais aussi pour donner notre bénédiction et soutien dans leur nouvelle aventure en tant que couple. We gather today not only to witness the coming together of these two people`s lives, but also to give them the blessings and support they will need on their new journey as a couple. En vous liant l’un à l’autre, vous devenez chacun plus complet, vous complétant au travers la force de votre partenaire. Vous terminez chacun votre chemin pour en commencer un autre, main dans la main. En ce début de nouvelle vie, vous devez savoir que ce ne sera pas chose facile. Le cheminement de l’Amour véritable est rempli de surprises et de défis, et nécessite du courage ainsi que de la foi en vous, en chacun et dans l’amour que vous partagez. Aujourd’hui, vous entrez dans cette nouvelle aventure ensemble, main dans la main, avec toute la force et bénédiction que vous avez besoin. Ceci fait maintenant environ dix (10) ans que je connais Arnaud, nous nous sommes rencontrés dans un festival Geek du nom du Domaine du Créateur. Les frères Franco m’ont adoptés rapidement et notre amitié était scellée. Durant ces dix (10) années, Arnaud et moi avons eu de nombreuses discussions, aventures et expériences. Au courant de chacun de ces moments, Arnaud a toujours été un ami passionné, quelqu’un sur qui on peut compter en amitié, qui me dira la vérité lorsque j’en ai besoin. Arnaud m’a toujours impressionné par son incroyable concentration qu’il amène à toutes les sphères de sa vie, qu’il soit en train de travailler, de jouer, ou juste en train de vivre. Il est un farceur reconnu, confrontant les nouveaux défis tête première avec aisance, et sa nature compétitive lui permet toujours d’aller de l’avant. Il a toujours été un ami fidèle, chaleureux et généreux. I have known Arnaud for almost 10 years, having met him at a Geek festival called Domaine du Createur. The Franco brothers took me in quickly and our friendship was sealed. In the past 10 years, Arnaud and I have had many debates, adventures, and experiences. And through all of these moments, Arnaud has always been a fierce friend, someone I know will always have his hand out in friendship, and will tell me the truth when I need to hear it. Arnaud has always impressed me by his incredible focus that he brings to all parts of his life, whether he is working, gaming, and just general living. He is a notorious prankster, takes on new challenges with a strong sense of self-confidence, and his competitive nature keeps him pushing forward. He has always been a loyal friend, warm-hearted, and generous of spirit. The first time I met Sarah was at an evening of bowling, but that’s not where she made the strongest impression on me. It was a couple of months later, in February 2010, when I made my way out to Le Cage Aux Sports, a sports bar at the Bell Centre to watch Team Canada vs Team USA in Olympic Men’s Hockey. The bar was packed with people and everyone was dressed in Reds, either with the Team Canada jersey or their Habs jerseys. And in this sea of Patriotic Red was Sarah dressed proudly in her Blue NY Rangers hockey jersey. It was like a page stolen from the Roch Carrier story about the Hockey Sweater, except Sarah was unapologetic. She was there to see Team USA win and she didn’t care who knew it. Every time the US scored a goal, she was on her feet cheering while everyone else had their heads in their hands. It was then I knew this girl was fearless, fiercely loyal, and the kind of geek I would grow to love. Since that fateful day, I have watched Sarah take on her life with the same zeal. She is confident, assertive, passionate, kind, generous, and fiercely loyal to her friends, family, and her beliefs. If you are forced into battle, you definitely want Sarah at your side to see you through to victory. In my case, it might mean I would get hit in the head a little less often. Et maintenant, ces deux gens passionnés, courageux se sont retrouvés dans cette vie et on choisit de s’engager l’un à l’autre. Ce que j’adore lorsqu’on les observe, c’est le constat qu’il reste eux-mêmes, autant individuellement qu’en couple. Bien franchement, je ne suis pas certain que l’Univers est prêt pour ce que c’est deux forces peuvent et vont accomplir ensemble. And now these two fierce, fearless people have found each other in this life and have chosen to make this commitment to each other. What I love about watching the two of them is that they are the same people on their own as they are when they are together, if not more so. Quite frankly, I’m not sure the universe is prepared for what these two unstoppable forces will accomplish in their life together. Marriage is the creation of a family of choice- you can’t choose your blood family, but the family you make when you marry is entirely by choice. And this power to choose makes this kind of vow and commitment ever more powerful and meaningful. I have no doubt they will honor this vow with passion, fearlessness, compassion, and with a great deal of love and respect for each other. Arnaud and Sarah chose each other, they chose to make a commitment to a life together, to include all of us in this decision, we chose to share in this day, and we all choose to continue to make ourselves a part of many choices and decisions to come. Le problème avec les fleurs est, aussi belles soient-elles, elles sont de courte durée et tiennent rarement le coup aux températures extrêmes. Elles sont fragiles, se fânent rapidement et ne durent pas. Un Nouvel Amour est toujours joli : merveilleux, plaisant et fragile. C’est excitant, ça vous réveille la nuit en pensant à votre bien aimé, remplie vos journées d’un bonheur indescriptible. Bien souvent, elle ne dure pas et se fâne au travers le temps. L’Amour que je souhaite pour Arnaud et Sarah devra être plus fort que celà et rester aussi merveilleux, plaisant et beau à regarder. The problem with flowers is, as beautiful as they are, they are not too short-lived and do not hold up well in harsh weather. They are fragile, they fade quickly, and they don’t last. New Love is a beautiful thing: it is wondrous, fragrant, and fragile. It’s exciting, it keeps you up late at night dreaming of your loved one, it fills your days with a happiness that is indescribable. But it often short-lived and fades over time. The love I wish for Arnaud and Sarah has to be tougher than that, and still be just as wondrous, fragrant, and a beauty to behold. Donc, au lieux des fleurs, j’ai mon propre cadeau à partager. Je viens d’offrir à Arnaud un bouquet de menthe, et j’ai donné un bouquet d’achillée mille feuille à Sarah. Ces plantes sont merveilleuses, plaisantes et fortes. Pourquoi? Parce que l’autre point qu’ils ont en comment c’est qu’ils s’agit de mauvaises herbes. C’est exact, des mauvaises herbes. I just gave Arnaud a bouquet of Mint, and I gave Sarah a bouquet of Basil. These plants are wondrous, fragrant, and tough. Why? Because the other thing they have in common is that they are weeds. That’s right, weeds. La menthe représente l’affection, la compassion, la sagesse et la vertu. The Mint represents caring, compassion, wisdom, and virtue. I hope that the love that Arnaud and Sarah have in this moment and for the rest of their lives is as tough as these weeds and as difficult to destroy. These two people will share beautiful moments, face challenges together, and live through difficult times because this is all what a full life contains. And through all of this wonderful life, their love cannot be a wilting, faded, fragile flower because its not what will sustain them. Their love needs to be a weed that throws down roots deep into the ground, a weed that is stronger than fear or doubt, a weed that is so strong that it can continue to grow and flourish, even in darkness. And from that strength, their love will bloom strong with a green flame of desire, passion, and a stubborn knowledge that it will prosper and grow as the years pass. I, for one, look forward to seeing and sharing the wonderful life that Arnaud and Sarah will continue to build with all of us.